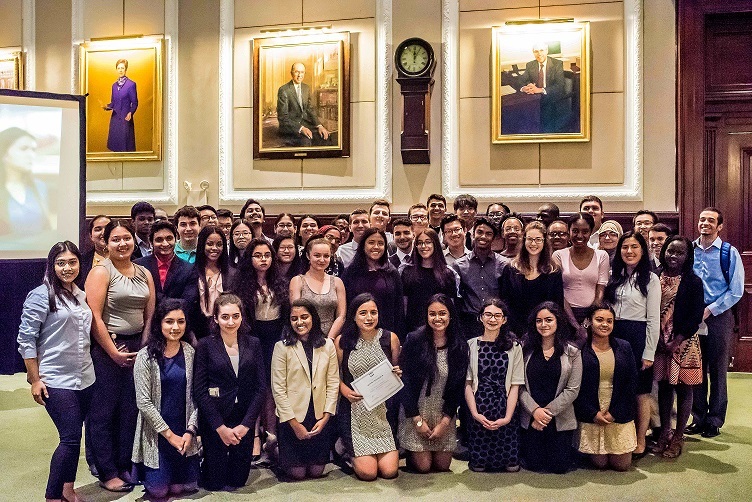 The Thurgood Marshall Summer Law Internship Program places diverse New York City public high school students with legal employers for the summer. This program runs annually from March through July and is part of the Association's continuing efforts to enhance the diversity of the legal profession. Student applications for summer 2019 are now closed. Students from the 2017 Thurgood Marshall Summer Law Internship Program celebrate their successful completion of the program with a Closing Graduation Ceremony in August 2017. Photo by T. Clay. The Thurgood Marshall Summer Law Internship Program is an intensive program which places diverse NYC public high school students with legal employers for the summer, and provides them with additional programming before, during, and after the summer designed to help them prepare for a legal career. Students are selected to participate in the Program based upon personal interviews and demonstrated academic excellence. Job assignments in firms vary depending on the needs of the employer, but typically include assisting paralegals, filing, record keeping, assisting library and back-office personnel, data entry and document and exhibit organization. Prior to interviewing with employers, all applicants participate in a mandatory, three-part Pre Employment Training. The purpose of this training is to identify the students who are most prepared to take on the requirements of the Thurgood Marshall Summer Law Internship Program, and to provide valuable training for all students to help them strengthen their application materials for future opportunities. These trainings, in collaboration with human resources representatives from partner firms and career services professionals from regional law schools, provide all applicants with one-on-one resume and cover letter review, presentations on interview preparation, mock interviews, and general office etiquette including email/telephone training, speaking and presentation exercises; and professional attire workshops. Roundtable orientation sessions, led by alumni of the program, include discussions on successful internship guidelines, such as workplace attire, electronic etiquette, networking, interacting at meetings and workshops, and tips for making a lasting impression. A panel of four attorneys in diverse career fields speaks about their career paths and provide advice for attaining one’s professional goals. The students are then divided into small group sessions with attorneys who speak about their career paths, and the students report back to the group, followed by an open networking session. A comprehensive networking training, followed by participation in a Speed Networking Program hosted by a law firm, during which students meet in speed-sessions with volunteer attorneys. To culminate their internships, students spend a week shadowing attorneys in companies and organizations; each student is paired with the company that most closely aligned with their career aspirations. The students participate in meetings and observe attorneys within each organization. Job Shadow Week may also include a law school tour and/or courtroom visit. Students attend a small graduation ceremony and reception featuring remarks from supporters of the program and receive a certificate of successful completion. Student applications for 2019 are closed as of Friday, January 18, 2019, and further extensions will not be granted. To volunteer at a weekly development program, please use the Volunteer Attorney Registration Form. To host a student for Job Shadow Week, please use the Job Shadow Registration Form. To encourage continued participation in the Thurgood Marshall Program, the City Bar implemented an Alumni Council to provide support and programming for past participants. To participate, please fill out the Alumni Council Registration Form.